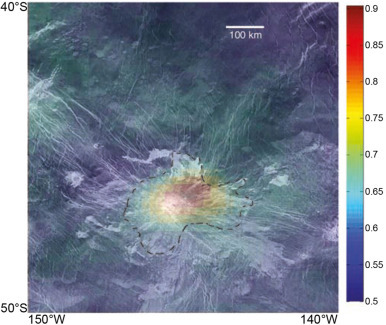 In Idunn Mons on Venus: Location and extent of recently active lava flows, Piero D'Incecco and his colleagues looked closer at 1 µm thermal emissivity anomalies on the eastern flank of Idunn Mons, as observed by the VIRTIS instrument on Venus Express. 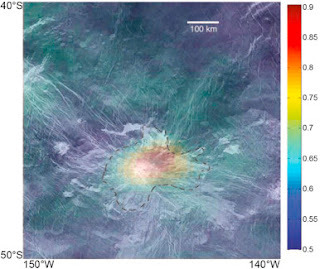 Hypothesizing that recent lava flows were responsible, they overlayed the VIRTIS emissivity data with SAR images from the Magellan mission to look for lava flows that may have resulted in the high emissivity. They created a geologic map of lava flow units on the eastern flank, creating outlines on Magellan SAR images. They then used software that models the best fit of emissivity data to the flow areas. They conclude that the lava flow units on the eastern flank of Idunn Mons are likely responsible for relatively high 1µm emissivity observed by VIRTIS. This is consistent with their reconstructed stratigraphy (i.e., relative ages) of the various lava flow units. They also note that the average microwave emissivity of the lava flows is consistent with dry basalts (i.e., cooled volcanic rock), and also may indicate limited chemical weathering. Their data are consistent with lava flows that are young enough that they have not experienced significant weathering, and may represent recent or even active volcanism on the surface of Venus. The authors look forward to new data to be collected by VERITAS, a Discovery Program finalist mission that sadly, was not selected.